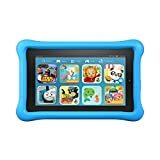 Amazon has the Fire kids edition tablet, 7" display, Wi-Fi, 8 GB, blue kid-Proof case for $99 with free shipping. Sells for $99+ Highest Price. Deals for $79 Lowest Price. Normally $92+. 8 or 16 GB of internal storage. Add a microSD card for up to 128 GB of additional storage.